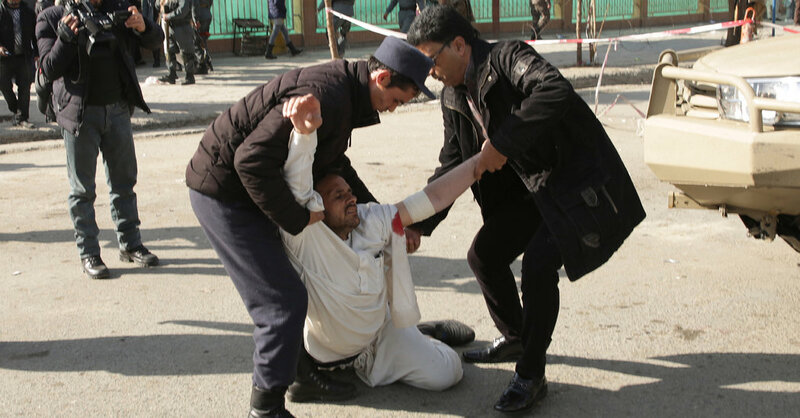 A wounded man was assisted at the site of an explosion in Kabul, Afghanistan, on Saturday. KABUL, Afghanistan — At least 40 people were killed and more than 140 wounded when a massive explosion rocked a busy Kabul street on Saturday, Afghan officials said. Officials feared the death toll could still rise. The Taliban claimed responsibility for the attack. Waheed Majroh, a spokesman for the Ministry of Health, said that 140 wounded had been brought to Kabul hospitals so far. The city’s hospitals were overwhelmed by the number of wounded. “It is a critical situation,” Mr. Majrooh said. The attack happened on a guarded street that leads to an old building of the Afghan Interior Ministry and several embassies. The Interior Ministry said the explosives were placed in an ambulance that managed to pass the first checkpoint at the street’s entrance.